Learn how to make a Fancy Cord Rosary using regular "Mission Beads"
which are used to clamp off the Cord ends, instead of tying off with Barrel Knots. giving an ordinary "Mission Rosary" a lovely "fancy" finished look. 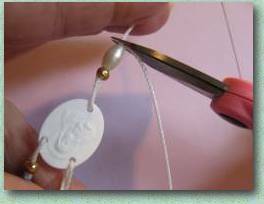 Making this rosary is easy for adults, and for children who are able to work with pliers. 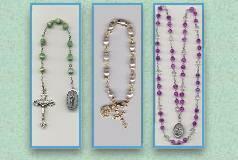 The style of beads and colors for this rosary are limited only by your imagination! 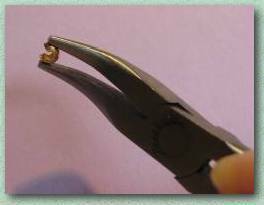 You may use Bent Nose Pliers, Crimping Pliers, or Flat/Chain Nose Pliers, whichever are more comfortable for you for working with Crimp Bead Covers. 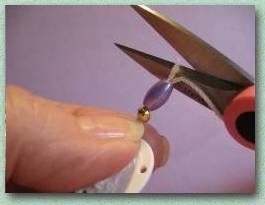 If you have never worked with Crimp Bead Covers, first practice picking up the beads with the pliers tip so that you can handle them without marring the surface, developing a gentle touch without squeezing or closing the bead before you intend to. 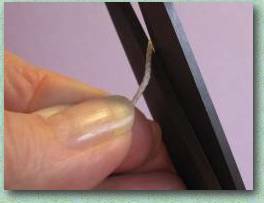 Before you begin, prepare your 45 inch length of Bonded Cord by heavily coating both ends with clear enamel, tacky glue or other stiffening product such as "Qwik Stiff" to keep the cord stiff and the ends from fraying while you work. Coat about one inch of both ends on all sides, and let dry completely. 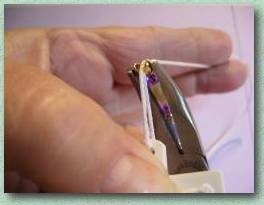 When the Cord ends are completely dry, trim one end to a point with sharp scissors, forming a "needle" with which to thread the cord on to the smaller size beads. 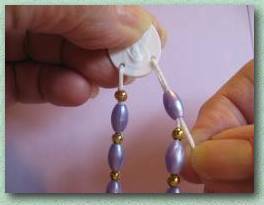 Prepare your Rondelles and accent beads, if needed, by reaming out the holes so they will be large enough for your Cord to pass through, or to smooth away any rough edges on glass or metal beads which may wear on the Cord. 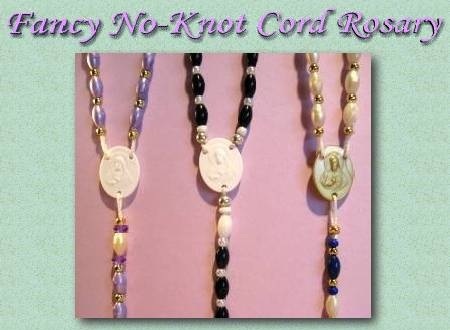 With all preparations completed, you are now ready to make your Fancy No-Knot Cord Rosary. Thread the "needle end" of the cord through one hole in the Center piece about one inch or so. Line the cords up side by side and slip a bead on to the long end of the cord. 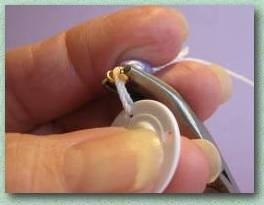 Slide the bead in to place so that the short cord passes through the bead. Work slowly. 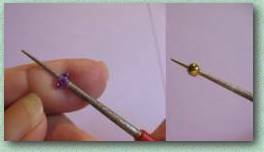 Use the thumb nail of your work hand to push the bead on to the short cord, while pushing the stiff end of the cord through the bead. It will feel like it just won't fit! But it really will! 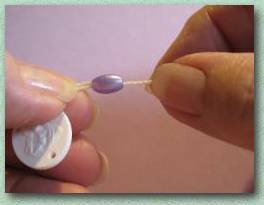 When the short end of the cord is passed through the whole bead, move the bead along the cords to about one half inch from the Center piece. Do not cut the excess cord just yet. 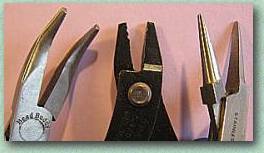 Pick up a Crimp Bead Cover with your pliers tip with the opening facing the top, as shown. Lay the cords over the opening of the Crimp Cover so that one cord is on top of the other, pulling them inside the circular opening of the bead. 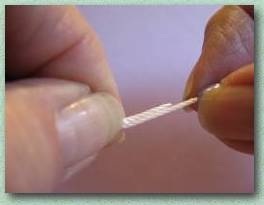 Gently squeeze the Crimp Cover closed, matching sides around the cords, so that a round bead is formed. 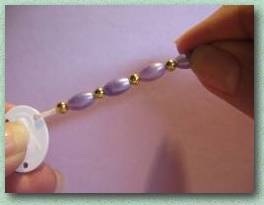 Use enough force to close the bead but not flatten it. 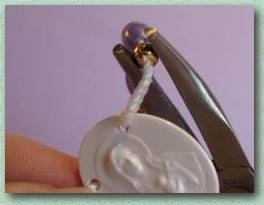 Trim the excess cord with sharp scissors, as close in to the bead as possible. For the decades, separate each of the 10 Ave beads with smaller accent beads of your choosing. 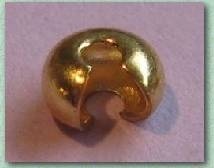 Craft stores readily carry 3 - 4mm gold or silver color plastic and metal beads. 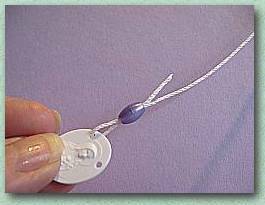 Make sure the bead hole is large enough for the cord to pass through before making your purchase. You may use an alternate color bead for the Paters. Add a 4 - 5mm Rondelle bead, or any accent bead of your choice to both sides of each Pater bead as you proceed to build the decades. Do not add a separator bead after the last Ave of the 5th decade. When all the decades have been completed, draw the long cord end through the other side of the Center piece. 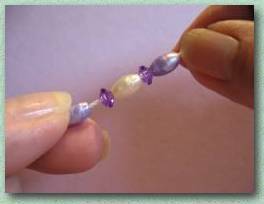 Hold the Center up to let the beads dangle freely below, easing any twisting of the cord. 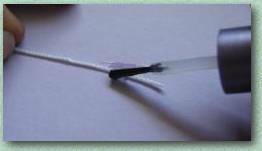 Ease the long cord back again through the bead, using the same method as shown above. Pull the long cord to mark the proper placement of the last Ave directly across from the first Ave, for a nice uniform look. You will now use the remaining cord to finish off the Rosary. Cut the stiffened end of the cord to a point. If needed, coat again with enamel and let dry before cutting. Thread the cord through the remaining hole in the Center piece, and then back through the Pater bead, as usual. Clamp the Crimp cover bead around both cords, about a half an inch from the Center. Trim excess cord. 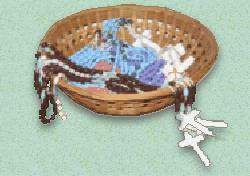 Add Rondelle beads, separator beads between the 3 Aves, and the last Pater, as usual. Thread cord through the Crucifix opening, and back through the Pater, as usual. Place Crimp Cover about one half inch from the Crucifix and clamp closed securely around both cords. Trim excess cord. Now hold up your new Rosary and admire your beautiful work! ** This rosary may be made using regular barrel knots instead of Crimp Cover beads, but the length of cord used must be increased to accommodate the use of the separator beads and rondelles. To calculate the approximate length of cord needed, measure the length of each of the beads types and multiply by the number of each bead you will be using. EXAMPLE: Mission beads - 59 x 1/2 inch = @ 30" Accent beads - 1/8 inch x 59 beads = @ 8" Rondelles - 1/4 inch x 12 = @ 3"